Manifesto (PDF download): Tokyo Sexwale manifesto. Football background: Organising Committee for 2010 World Cup, FIFA Committee on Racism & Discrimination, FIFA Media Committee, Chairman FIFA Monitoring Committee on Israel and Palestine. Non-football background: ANC activist and ex-prisoner of Robben Island. Former Premier of Gauteng Province. Former Minister for Human Settlements. Businessman (mining). Philanthropist. Any corruption? None confirmed. Some South African journalists have reported significant concerns with his business arrangements. Enemies: Other countries on the African continent. Links to other candidates: Sexwale and Champagne have known each other since at least 2004. Champagne was another guest at Camp Beckenbauer (see below). There may well be a deal between the forces behind Sexwale and Sheikh Salman. If name alone was all that counted, ‘Tokyo’ Sexwale – so nicknamed because of his love of karate – would be a lay-down misère for FIFA President in the court of social media public opinion. But with his formidable pedigree as a member of Steve Biko’s Black Consciousness Movement in the 1970s, and subsequent 13-year incarceration on Robben Island, it’s clear that Tokyo Sexwale is more than a man with an unforgettable moniker. He has also undertaken military officers’ training in the former Soviet Union and is still an Honorary Colonel in the South African Air Force; he earned a Commerce degree while at Robben Island and holds several honorary degrees; he is a major player in the South African diamond industry; is involved with bilateral business groups between South Africa and Russia and South Africa and Japan; has been a television personality on the South African version of The Apprentice; is a member of the Brookings Institution International Advisory Council; and is recognised as a major philanthropist. His philanthropy includes the Sexwale Family Foundation, the Nelson Mandela Foundation, the Robben Island Ex-Prisoners Trust and the Desmond Tutu Peace Trust. To cap it off, Sexwale is a politician. He served in the Gauteng Provincial Government for four years from 1994, was a leading figure in the African National Congress from 1994 to 2010 and was Minister for Human Settlements in the Zuma Government from 2009 to 2013. From all reports, Sexwale expected and wanted to go further in his political career. He was touted as a possible President of the African National Congress in 2007, before throwing his support behind Zuma, and was a candidate for Deputy President in 2012 coming third in a three-person race. Sexwale caught the football bug as a child in Soweto where his father, Frank ‘Killer’ Sexwale, was vice-president of the Dube Golden Brothers side. At Robben Island, Tokyo was secretary-general of the recreation association that operated the Makana Football Association which was given honorary membership of FIFA in 2007. While still Chairman of his diamond mining company Mvelaphanda Holdings (sponsor of the second division Mvela League) and a non-executive director of Barclays Africa, Sexwale also served as a member of the 2010 World Cup Organising Committee from 2004 to 2010. Continuing the narrative of his life, he launched FIFA’s ‘Say No to Racism’ campaign in 2006 along with Blatter and head of the 2006 Organising Committee, Franz Beckenbauer, whom he considers a friend. Today, Sexwale is a member of FIFA’s Global Task Force against racism and discrimination (a committee chaired by Jeffrey Webb until his arrest in May), its Media Committee and is Chairman of the FIFA Monitoring Committee on Israel and Palestine. He is also the founder of Global Watch: Say No to Racism & Discrimination in All Sport that was launched, with the support of FIFA and other sporting organisations, in November 2014. “Racism is a society problem. It’s like a monster that is trying now to infiltrate sporting fields. It’s not born out of the sporting field, but it can definitely destroy the field of sport. If we don’t stand up, if we allow racism to overpower sport, we will be doomed to existence in a hostile world,” he said at the time. On paper, with his background as a freedom fighter, his experience as a politician, his lifelong commitment to eradicating racism, his business credentials and his knowledge of FIFA, Sexwale appears a strong candidate. When he announced his candidacy, Sexwale focused on his business credentials. Franz Beckenbauer thinks he’s the man for the job. Beckenbauer endorsed Sexwale’s run for the Presidency, describing him as ‘neutral’ and suggesting that he would be supported by the German Football Association (DFB). 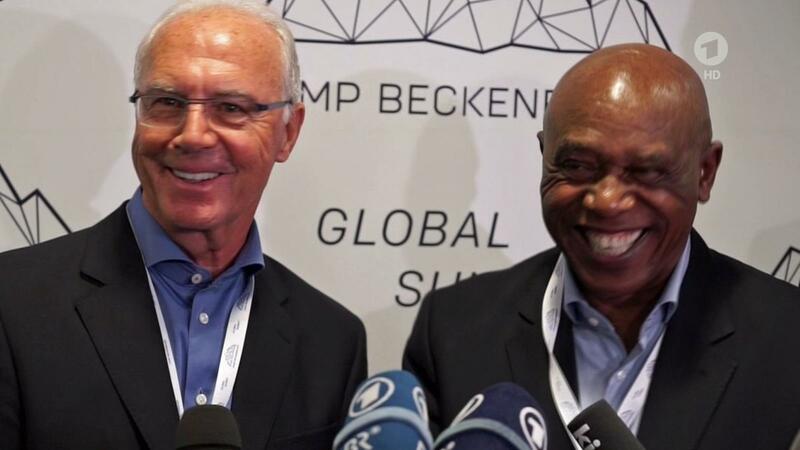 A few weeks prior to announcing his candidacy, Sexwale was a guest at the annual Camp Beckenbauer where, amongst other things, the pair announced a strategic partnership between Camp Beckenbauer and the Nelson Mandela Foundation that Sexwale chairs. 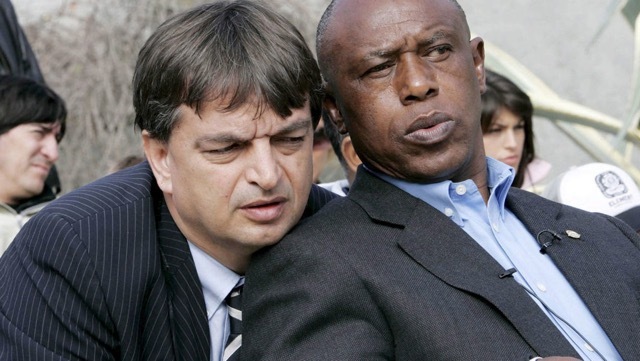 Sexwale has since been endorsed by another football man at Camp Beckenbauer, former Israeli national team player (and ex-PSG and New York Cosmos), Mordechai Shpigler. Beckenbauer’s close associate, Fedor Radmann, who helped bring the World Cup to Germany in 2006 and to South Africa in 2010 – but spectacularly failed to do so for Australia in 2022 – is one of Sexwale’s ‘strategy advisors’ as he navigates his way through the 209 members of the FIFA Congress. Considering one of the corporate partners of Camp Beckenbauer is the Qatar-based International Centre for Sports Security (ICSS), it’s little wonder, therefore, that Sexwale turned-up in New York a few weeks later as one of the star attractions of the ICSS Securing Sport summit. 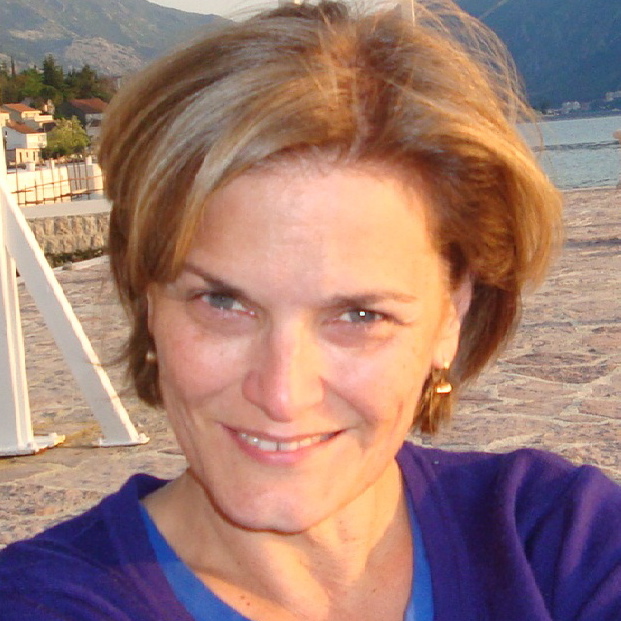 Veteran football journalist and FIFA-watcher, Keir Radnedge, said that it was clear FIFA was not Sexwale’s main priority. “Sexwale did ramble round to address the FIFA crisis eventually, albeit as if something of an afterthought. He did so in generalisations and platitudes before concluding with – for the second time in a week – a misrepresentation of the stated case of the World Cup’s four US-headquartered sponsors,” wrote Radnedge for World Soccer. Instead, he praised the ‘more muted’ public statements of another of FIFA’s sponsors, adidas, which is also a sponsor of Camp Beckenbauer. A company with close and longstanding ties to FIFA, one of the other guest speakers at Camp Beckenbauer was the chief executive of adidas, Herbert Hainer. Sexwale batted away the criticism of his performance in New York. Like anyone in politics, he knows that the only poll that counts is the one on election day. But unlike real politics, what the media and the public think is immaterial in the ‘FIFA Way’ of doing business. With his roll call of gold-plated supporters and advisors, expect Sexwale to be there or thereabouts on February 26 – unless a deal is done beforehand.